Congratulations to our Manchester partners Manchester Metropolitan University, Siemens UK and Manchester City Council for winning the Public Building Energy Project Energy Award of the Year 2018. The project partners demonstrated how technology can improve sustainable mobility, energy, ICT and business: Nearly 600 solar panels have been installed on the roof of the Brooks Building at Oxford Road Corridor to provide low carbon energy on campus. Moreover, a Siemens Lithium Ion Battery has been installed to reduce demand on the energy network at peak times, all controlled by intelligent technology. It was this energy management and optimisation aspect of the project that won the Public Building Energy Project of the Year Award 2018, run by EMAP Publishing. “Empowering local authorities in the clean energy revolution” was the focus of this event, sponsored by Siemens, taking place in Manchester at 31st January. The conference brought together the Departments for Business, Energy and Industrial Strategy, Leeds Climate Commission and UK100 to discuss how local authorities can be empowered to create a local energy system fit for its residents and meeting climate change objectives. The power to make this change depends on local authorities and the right funding, from either private investment or central government. The energy system in the UK has moved from centralised to decentralised power, and now more than a quarter of the electricity consumed across the UK comes from renewable sources. Learn more about CO2 reduction strategies in the UK, the Triangulum project and the role of project partner Siemens in the article by Carl Ennis, Managing Director of Siemens Energy Management at LinkedIN. 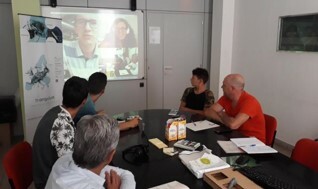 Catalan and Eindhoven-based students from the Technical University of Eindhoven (TU/e) continued the prototyping of solutions to face selected Sabadell challenges, as part of the TUE’s Master kick-off event and during an on-site visit to Sabadell coinciding with the Smart City Expo. The focus of this prototyping before April 2019 will be in the field of 3D modelling of Sabadell, in order to geoposition relevant real-time and static data of the city on this 3D model. During the on-site visit, the students contrasted their ideas with municipal officers from the police, geographic information system (GIS) and energy departments, as well as with other public and private operators in the field of GIS and sensoring. Their proposal on 3D modelling (called “MOD3L”) was designated as one of the finalists of the City of Sabadell’s Coinnovem contest on the 6th November. The current issue of the German journal “Transforming Cities” features an article about the mobility actions implemented in Eindhoven, one of Triangulum’s Lighthouse Cities. The focus topic of this issue is “Gesund und sicher leben in der Stadt”, which translates to “Living a healthily and save life in the city”. 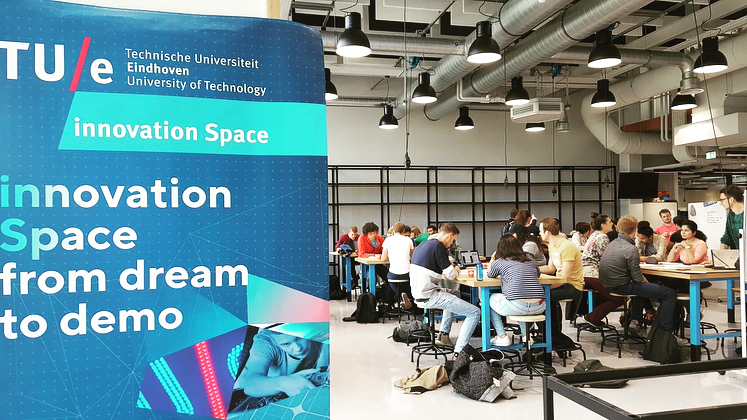 Eindhoven, with all of its innovative and first-of -a-kind solutions in the fields of enery, mobility and ICT, is a great exemplar for a healthy and save city of tomorrow! If you do speak German and are interested in learning more, check out the article here. The article has been written by Bettina Remmele (Steinbeis-Europa-Zentrum), main press contact of Triangulum. The Smarty City Expo World Congress in Barcelona (SCEWC) is one of the largest Smart City events in the world. But what is it that makes it also one of the best and most popular ones of its kind? As the world’s leading event for Smart Cities, the SCEWC provides a unique meeting point for the Smart City sector and an innovative platform for urban action worldwide. 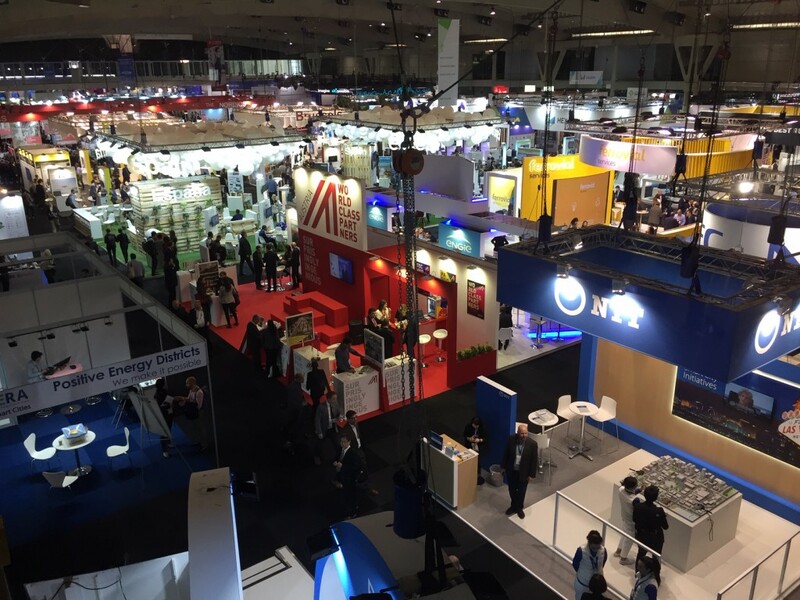 SCEWC, the event for cities organized by Fira de Barcelona, took place from 13-15 November at the Gran Via venue. In its eighth edition, it gathered representatives of more than 700 cities, featuring major capitals such as Athens, Atlanta, Berlin, Brussels, London, New York, Rome, Stockholm or Yokohama. Over 100 mayors and representatives from five continents were present, analysing how to undertake initiatives that seek to transform cities into places where the lives of their citizens improves. Triangulum, together with its 11 sister projects from the European Lighthouse Projects family, covers almost 80 cities across Europe. 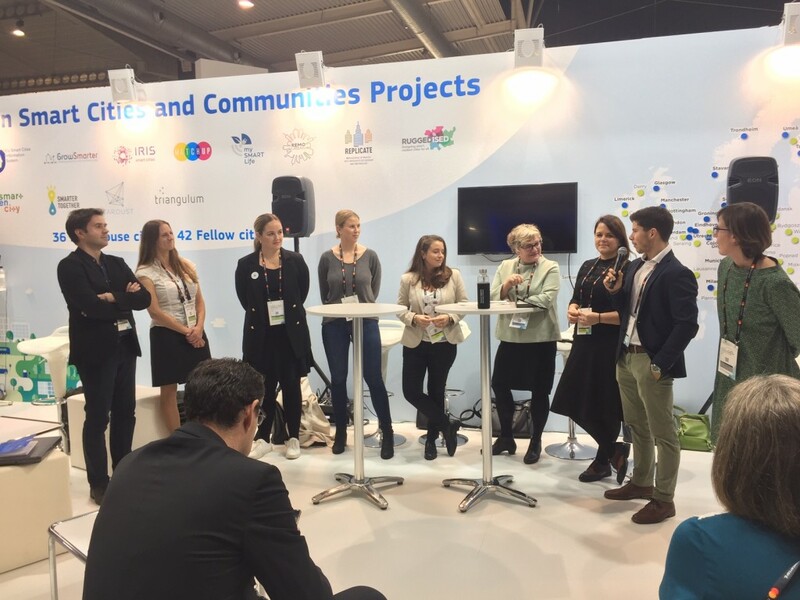 This year in Barcelona, the entire community, including the two EU initiatives SCIS and EIP-SCC, came together at a joint stand with various workshops and three larger Agora sessions to demonstrate how EU funded smart cities are leading the way in driving sustainable and smart innovation. The Smart City projects presented how they are putting smart technologies to the test and how specific solutions work in practice when it comes to reducing environmental impact and improving citizen’s lives. As part of the joint European Lighthouse Cities stand, Triangulum was represented at the Expo Tuesday through Thursday with various partners from the Lighthouse- and Follower Cities as well as from the other work packages. 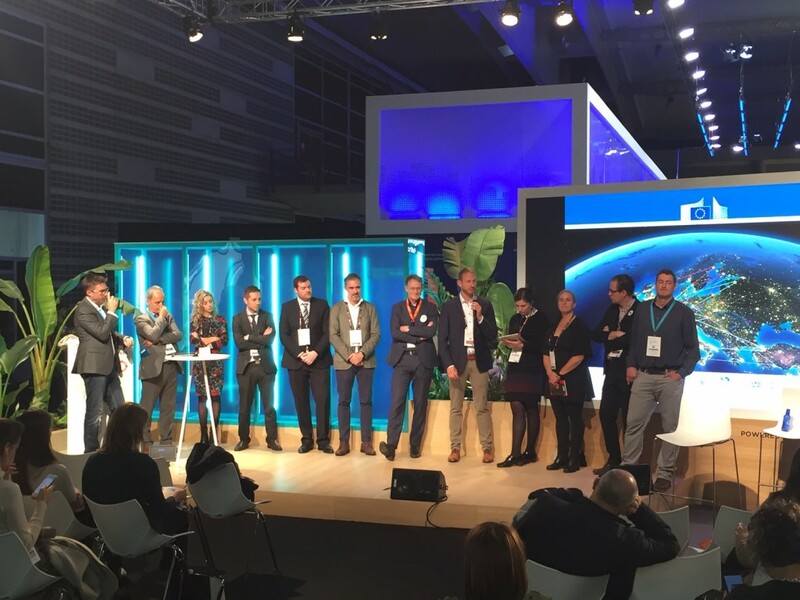 We from Triangulum used this opportunity to inform interested stakeholders as well as the broad public about our project and the progress in our six cities Stavanger, Manchester, Eindhoven, Sabadell, Leipzig and Prague. As one of the oldest and most experienced projects, we are in the middle of the monitoring phase and therefore have a lot of stories to tell, from pains and gains to best practices and lessons learned. 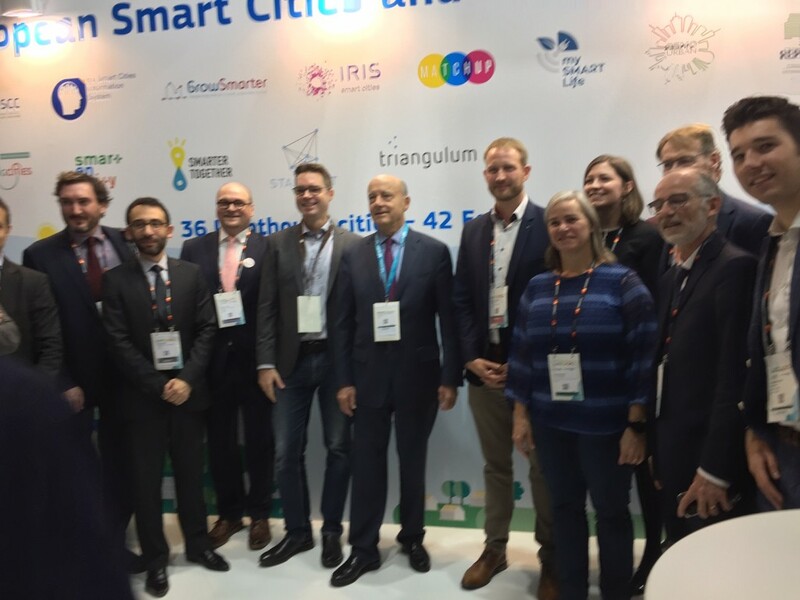 A special highlight was when the mayor of Bordeaux and former French prime minister Alain Juppé visited us at the stand to discuss the upscaling of smart cities towards a city-needs led European smart city market. Damian Wagner from Fraunhofer IAO, project coordinator of Triangulum, talked about the biggest challenges that we have encountered in the last few years at the Agora session “Trial. Innovate. Replicate. Smart Cities and Communities.” which has been moderated by Jens Bartholmes, Policy Officer from the European Commission, DG ENERGY. Oriol Llevot from the City of Sabadell chaired the workshop “Challenges and opportunities for replication of SC projects from the Lighthouse to Follower Cities and beyond”, taking place right at the joint stand. Alexander Schmidt from BABLE, former lead of our work package on replication, also took part in this discussion round. They talked about how Follower Cities are tackling the challenge of having to replicate the innovative solutions tested and implemented in the Lighthouse Cities without the supportive EU funding. Gabi Kaiser, leader of the cissemination & communication work package at SCIS and mySMARTLife, chaired the workshop “Communicating the Smart City” where she invited various Smart City communication representatives, both from Lighthouse- and Follower Cities but also projects in general, to talk about their best practices but also things that did not go as expected. Of course, Triangulum did not miss this opportunity to talk about our project-specific communication issues. Oriol Llevot and Rosa Torra from the City of Sabadell as well as Svanhild Sondresen from Greater Stavanger and Inger Hanne Vikshåland from the City of Stavanger participated in this lively discussion round. 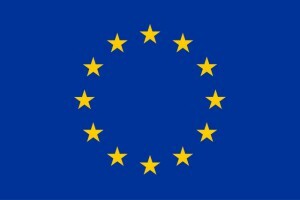 The 12 Smart City projects as well as SCIS and EIP-SCC have all received funding under the EU’s Horizon 2020 work programme as part of the EU’s long-term ambition to create a low-carbon economy and ensure continued competitiveness in the global market: mySMARTLife, Smarter Together, Replicate, Remourban, , SmartEnCity, Sharing Cities, Triangulum, Ruggedised, GrowSmarter, Stardust, IRIS, MatchUp., EIP-SCC and SCIS. IPR Prague initiated a business trip to Stavanger, inviting representatives of the local Prague consortium UCEEB (University Centre for Energy Efficient Buildings) and the city district of Prague 7 from the social and health departments to join. The aim of the trip was to gain more insights into innovative projects in the field of smart home care in order to support the implementation process of the Smart HomeCare pilot project in Prague 7. 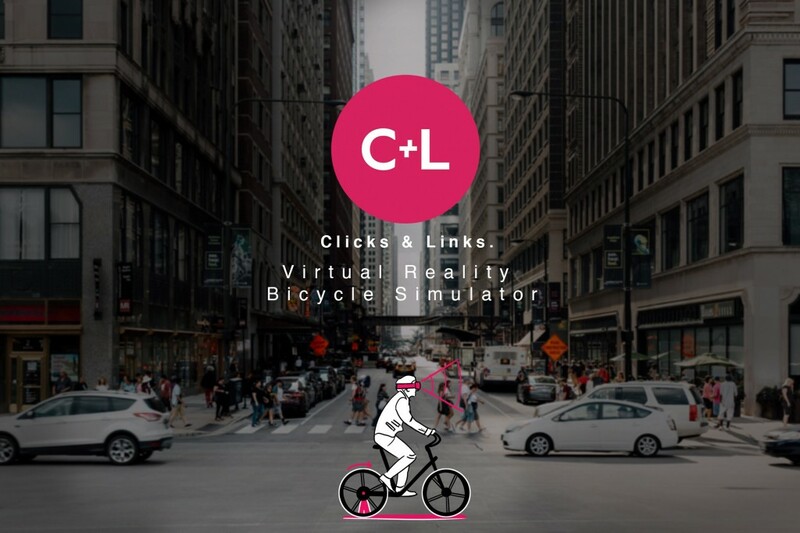 During the first two days, the Triangulum partner Lyse from Stavanger invited the local consortia from the Follower Cities of Prague and Sabadell to their headquarters to demonstrate the use of the Blink technology. Blink is a video communication device which enables secure communication with peers as well as health and social services. It has, for example, an add-on for health devices like an oximeter. Officers from the City of Sabadell’s social action department and the non-profit association “AVAN” (“Associació Vallès Amics de la Neurologia”) also attended the presentation. The demonstration took place in order to subsequently offer Prague and Sabadell the possibility to test up to five Blink devices in their local environments. In Sabadell, Blink will be installed to 5 “AVAN” patients before April 2019, as a pilot test financed by the Triangulum grant. The patients chosen in Sabadell will be young persons with acquired brain damage suffering from physical or knowledge disabilities. The goal of this technology implementation is to improve the autonomy, healthy habits and sociability of these patients, as well as to create mutual help groups with their families and the medical and social professionals. Such pilot testing is not only a great opportunity for Prague and Sabadell but also helps to provide valuable feedback on how this kind of technology can be installed and utilised in a local context. As a result of the Triangulum implementation strategy of Prague, it is proposed to make use of video communication tools which could support that elderly people can stay longer self-sufficient at home. 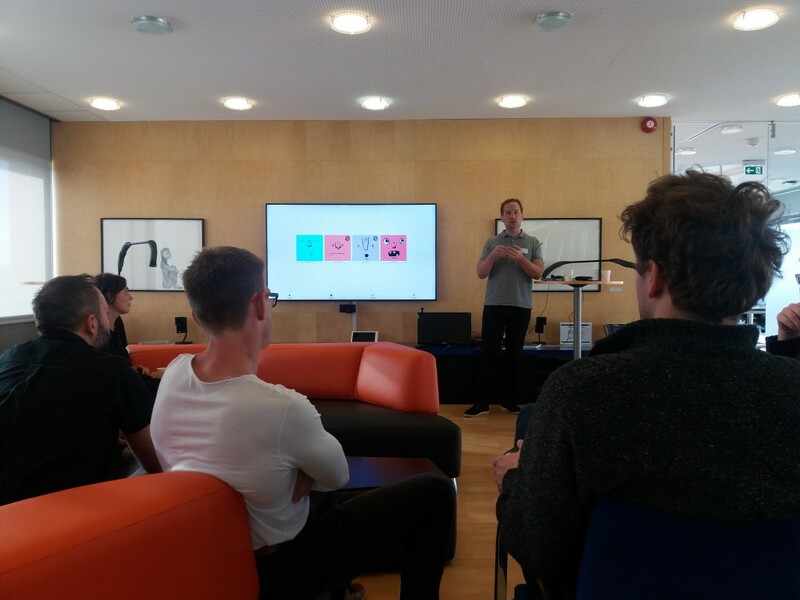 The Prague delegates also visited the innovative care department of Helsehuset office of the City of Stavanger which oversees innovation in the field of social and health care in their municipality. Mr. Bjarte Boe presented Stavanger’s approach for innovative care and shared his expert’s experience on the topic of smart home care. Afterwards, the group was led through a small exhibition, demonstrating helpful tools for homes for seniors and people with limited motoric abilities. 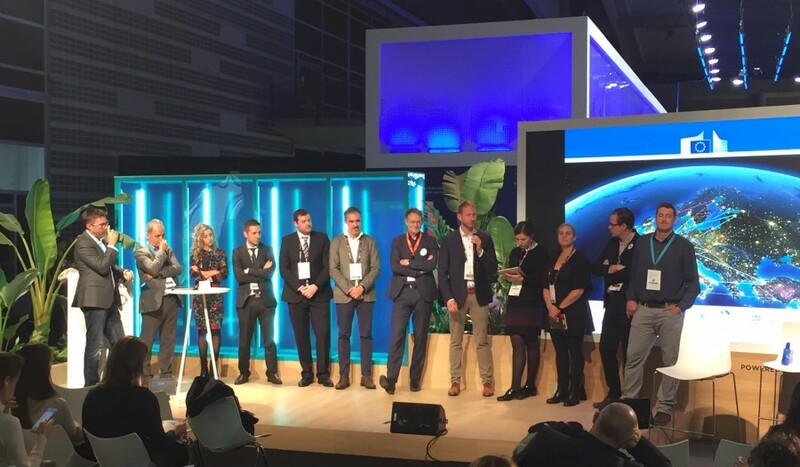 Of course, the Prague representatives also attended the Nordic Edge Conference and Expo where they joined speeches, discussions and the general exhibition in order to get inspired and to learn from the presented smart city projects and initiatives. At the expo, the team participated in a guided thematic tour for health care. 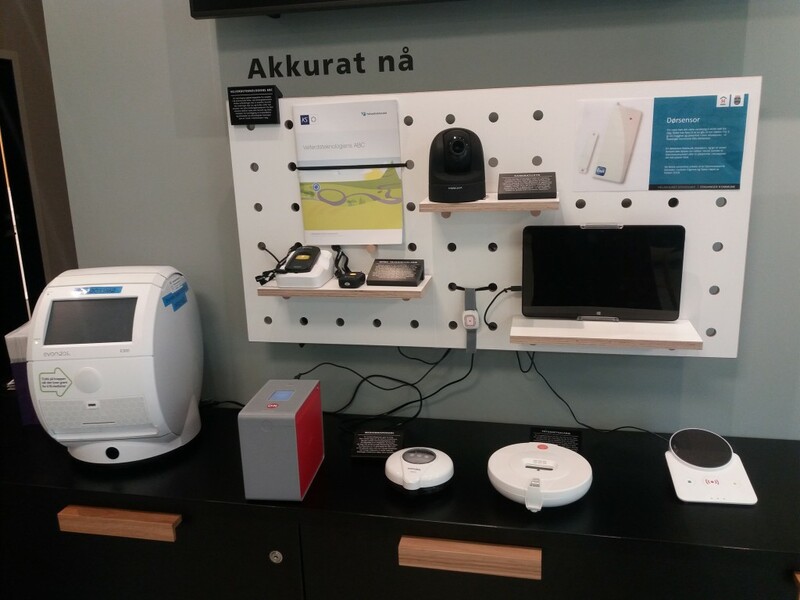 They discovered further technical devices which are working with sensors and which can be used in the field of smart homecare and learned about the Nordic health cluster. In addition, a session and a workshop on the topic of Better Ageing presented new inspiring ideas and projects. The visits affirmed that the innovative approach in the field of smart home care is essential for the future and beneficial in confronting the ageing population. 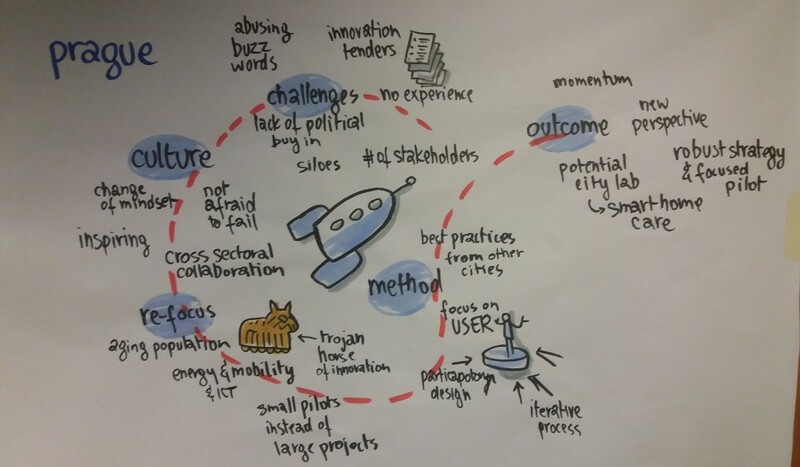 On 27 September, representatives of IPR Prague joined several workshops and discussions which were organized as part of the H2020 SCC1 Lighthouse- and Follower City day. Various communication leaders and city communication representatives from H2020 projects presented their success stories but also discussed problems and different approaches for communication and dissemination within their projects. 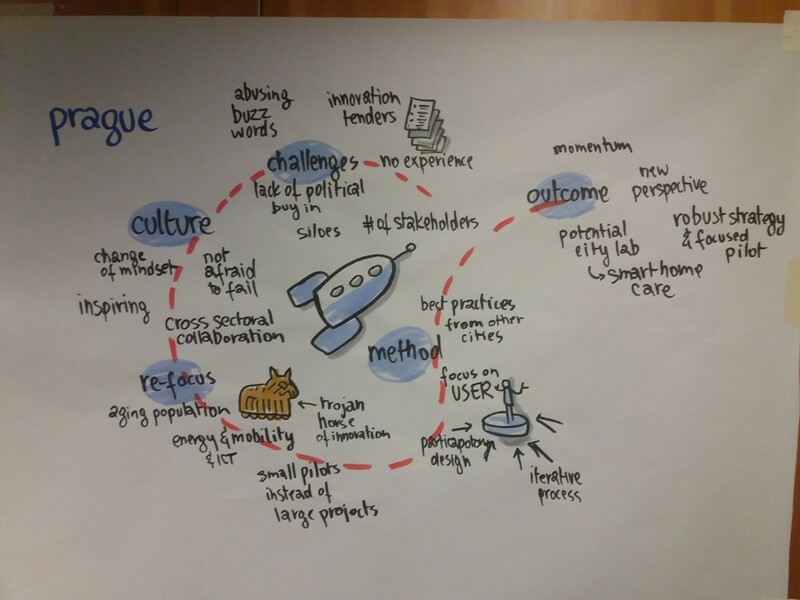 The results of each participant’s presentation were directly visualized by a graphic facilitator in a very creative way in order to mirror the discussions. 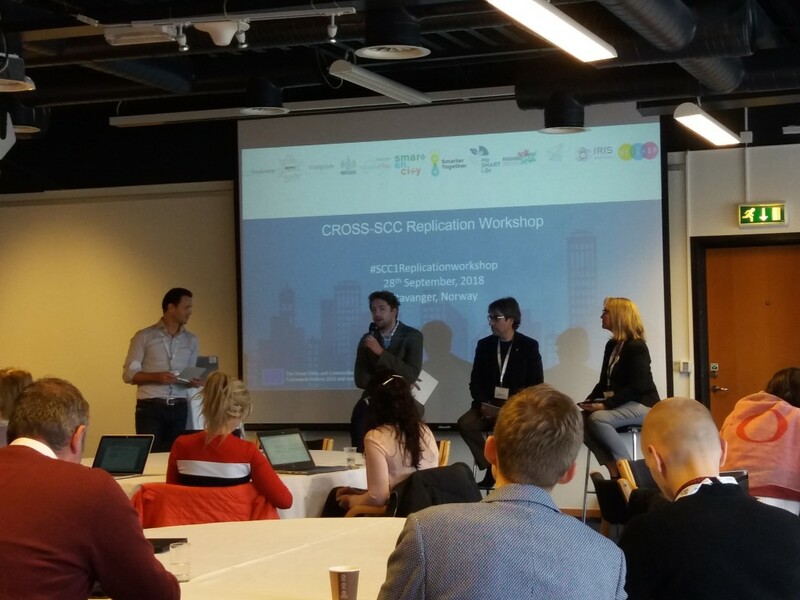 Finally, on Friday 28 September, the Prague representatives participated in the Cross-SCC Replication workshop which focused on fostering replication and upscaling of smart city solutions among the SCC1 community. During the workshop, IPR Prague, as a representative of a Follower City, was part of the panel discussion of Follower Cities where IPR shared the experiences which they have gathered during the course of the Triangulum project. We hope to transfer the energy and inspirations generated during this intensive week of workshops, trainings, discussions and speeches into the local projects that are already underway in Prague. 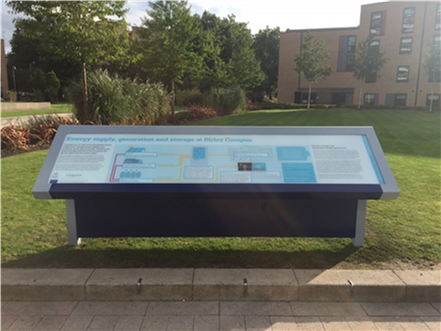 At Manchester Metropolitan University (ManMet), a sign has recently been erected providing details about Triangulum’s solar photovoltaic and battery storage installations at the Birley Fields Campus Energy Centre. As a key partner in Triangulum, ManMet benefitted from the installation of a Siemens lithium-ion battery, a micro-grid controller and an array of solar photovoltaic panels. These innovations complement the existing Combined Heat and Power (CHP) plant and the private heat and power network on site at the University. The micro-grid controller seamlessly connects and manages assets throughout the network – reducing energy costs (less power purchased at peak times/price bands), flattening of peak demand, increasing network resilience, and providing CO2 savings via the solar PV and energy storage facility. 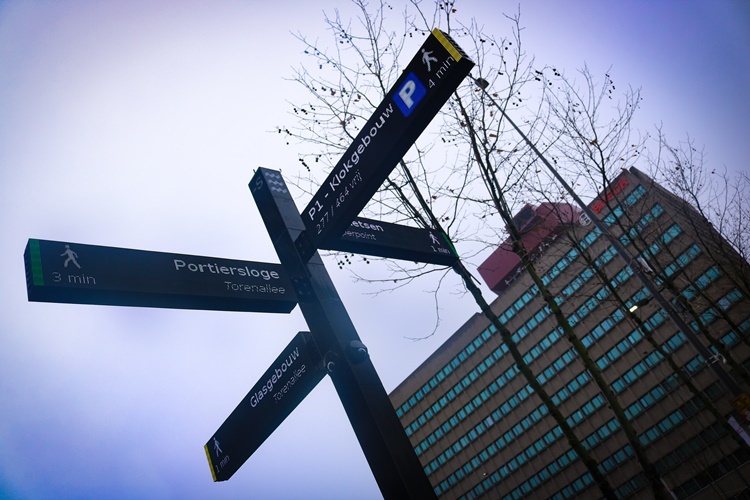 The sign provides students and visitors to the University with details of the impact and the benefits that Triangulum has brought to ManMet. 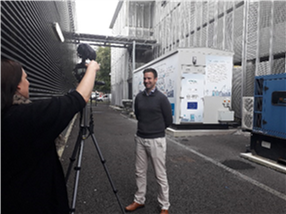 Various of the Triangulum project partners, especially from Manchester, have recently been interviewed by the Manchester Climate Change Agency News Channel. Andrew Smyth (Siemens) and Ettore Murabito (University of Manchester) were the first to talk about the Triangulum energy and ICT work that is taking place in Manchester. During his interview, Andrew mentions that, here in Manchester, “we are currently looking at how we can trial new innovative energy technologies”. For the full video, click here. Ettore speaks about the concept of Smart Cities in general and states that, in his opinion, the term “Smart City” is not a all unambiguous. Curious to find out what he means by this? Check out the entire video. Snapshots and previews of the interviews have been posted on twitter (and, of course, retweeted by us), with longer versions being uploaded to the MCCA News Channel on YouTube. Following on from these interviews with Ettore and Andrew, MCCA interviewed Jason Smith (Manchester Metropolitan University/ManMet) about the Triangulum mobility theme and how it has helped grow the e-vehicle fleet at ManMet. Currently, 14 electric vehicles are used on campus, representing 54 % of the entire fleet. The goal though is much higher. Interested in how high exactly? Check out the video here. MCCA also interviewed Triangulum’s project coordinator Damian Wagner (Fraunhofer IAO), and Kelly Watson (University of Manchester) at October’s Triangulum General Assembly held in Manchester. You can watch the video with Damian Wagner here. And don’t miss out on the video showing snippets from our General Assembly and featuring Kelly’s interview – click here! Fortunately, this is not even it. Pavol Gajdos (Manchester Bike Hire) is due to be interviewed by MCCA about the Triangulum Cargo Bike Loan Scheme as well. And who knows? Maybe there will be even more videos to follow. Stay tuned – we will keep you informed! And sign up for the MCCA News Channel on YouTube.